Most people today associate New Orleans’ Southern Decadence festival with a Labor Day weekend bacchanal comprised of thousands of (primarily) gay men invading the streets of New Orleans, transforming it into a riotous pleasure dome that Coleridge—even in his most opiate-induced dreams—could never have imagined. In this first book-length history of the festival, Howard Philips Smith and Frank Perez examine its origins from a humble bar crawl organized by a small group of (primarily straight) friends who were desperate to distract themselves from the oppressive late summer heat. Smith and Perez provide a detailed road map of this journey, which was long and complex, and not without its bumps on the road, including (but not limited to) in-fighting, AIDS, religious opposition, political opposition, scandal, and the occasional ill-timed hurricane. At times, Southern Decadence is a manifest listing not only who was Grand Marshal in any given year, but how much money he or she collected at which fund-raising events, and how many sets of beads the Grand Marshal threw from which balcony. At its most interesting, Southern Decadence in New Orleans examines the complex genealogy of decadence in the South, not just in terms of the artistic descent from Tennessee Williams (the most obvious literary forbear), but in relation to the poetry of Coleridge and Flaubert, the fiction of Flannery O’Connor and John Kennedy Toole, and the examination of decadence in the photographs of Clarence John Laughlin, and the films that John Waters and Federico Fellini were making at roughly the same time that the New Orleans festival was born. 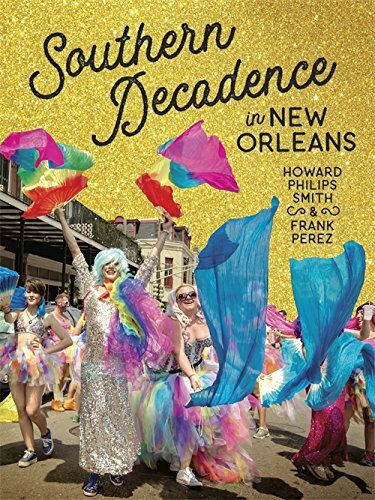 And going beyond artistic and literary associations, Southern Decadence in New Orleans is a social history, scrutinizing the complex social, racial, and sexual history of a city already known for its social, racial, and sexual anomalies, and continually turning up new revelations.